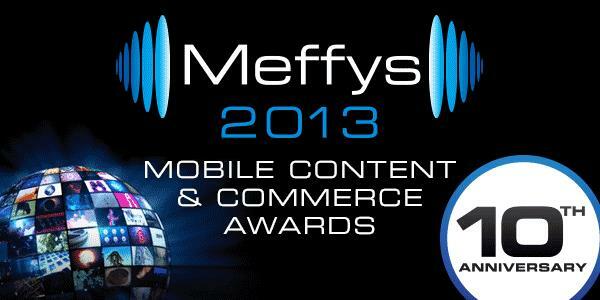 MEF today revealed the shortlist for the upcoming 10th annual Meffys awards, being held in Silicon Valley as part of the inaugural MEF Global Forum 2013 conference on the 14th and 15th November. After a grueling judging marathon (Meffys entrants are shortlisted by an international panel of over 40 journalists, academics, analysts and VCs) the thirteen categories were whittled down to 5 finalists each – no mean feat considering the quality and diversity of the entrants. This year saw submissions from established businesses, new businesses, agencies, start-ups, a host of new verticals, developed and growth markets (representing 25 countries in total!) – the range of entries spanned the total mobile ecosystem, reflecting the depth and maturity of the mobile content and commerce industry today. The winners will be announced at a Gala Dinner on 14th November at the Intercontinental Hotel in San Francisco. Traditionally a glitzy affair, the show will this year be hosted by Emmy nominated, award winning author & broadcaster who is also Google’s Head of Media Outreach, Partnerships Lead and official spokesperson; Daniel Sieberg. But for now, here is the full shortlist – head over to the Meffys website for more details and to get your tickets for the main event. Congratulations and good luck to all the finalists, we’ll see you in San Francisco! The 2013 Meffys are part of the inaugural MEF Global Forum – a two-day event connecting global mobile leaders in Silicon Valley. Speakers from over 20 countries include CEOs from Shazam and Evernote as well as guest speakers from VISA Mobile, Mozilla, Facebook, Telefonica Digital, Singtel Innov8 and many more.